New York fashion week is fast becoming an event for many recording artists to debut their latest fashion collaborations with major fashion houses. Some have even begun to drop their new albums alongside the clothing, as we saw with Kanye West and Yeezy Season 3. 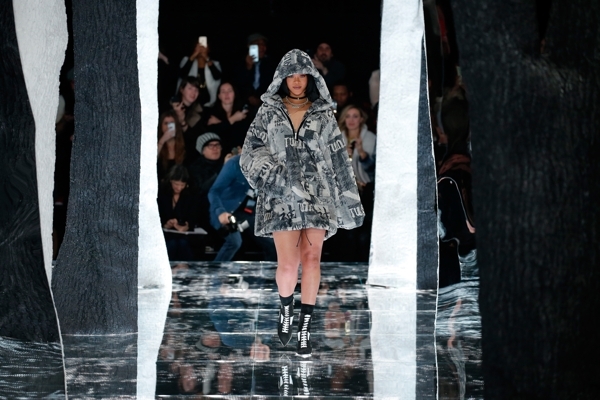 The day after the Yeezy release, the blogosphere went crazy with the fashion runway show from Rihanna for Puma. Rihanna drew inspiration from Japanese street culture and tradition for this first full season collection since partnering with PUMA in December 2014. Mixing that cultural influence with gothic overtones and exaggerated volumes and proportions, the fashion icon challenged the traditional male and female silhouettes and blurred the lines between genders that are often times too rigid for her fashion tastes. Consumers can catch some of the shows footwear styles this Spring/Summer season including her first official modern and futuristic training shoe, the FENTY Trainer which hits stores worldwide on February 26th. Rihanna’s Fur Slide will launch in April and the infamous PUMA Creeper returns in May with new colours. The AW16 PUMA by RIHANNA collection, under her FENTY label, includes a mix of fashion and lifestyle apparel, footwear and accessories and will be available at retail beginning September 2016. For more information, contact PUMA via their listing on CUT & SHOW. See all the looks from the show here.